On Wednesday night, June 20, 27 individuals, representing a wide range of ages and backgrounds, became official Docents of the NMAJH. The graduation exercises were the culmination of an intensive weekly course which began in October 2011. Over 30 weeks, the class was treated to a graduate level education on American Jewish history, with each session following the pathways of the Museum’s core exhibition. With lectures given by leading scholars in the field, together with gallery talks on the artifacts by members of the Curatorial Department, students received an integrated view on history and material culture. 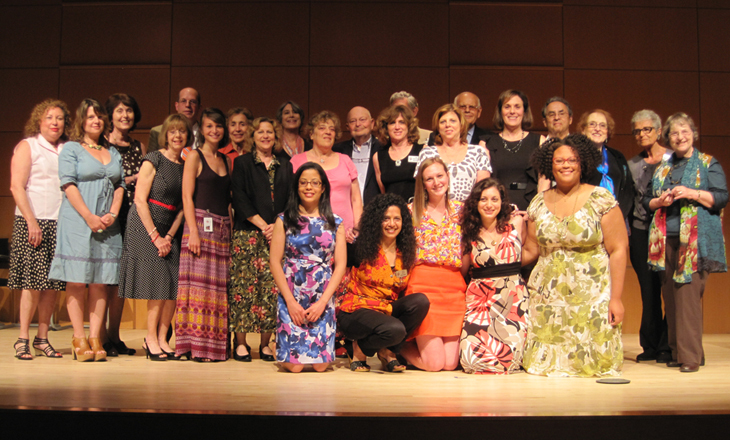 At the graduation ceremony, comments on behalf of the class were delivered with wit and wisdom by docent graduates Madison Shelton, Rachel Hollander, Paul Woolf, Natalie Hess, and Yerach Daskal. Senior docents Beryl Dean and Adele Fine awarded the Docent pins. The new graduates and their guests exited the Dell Auditorium to a rollicking mix of Gershwin’s “Strike Up the Band” and Elgar’s “Pomp and Circumstance.” Champagne toasts followed. And of course, there was plenty to eat. It was my honor to work with America’s first four women rabbis to curate our Contemporary Issues Forum gallery for the month of June, in recognition of the 40th anniversary of women’s rabbinic ordination in America. Rabbis Sally Priesand, Sandy Eisenberg Sasso, and Amy Eilberg, and Rabba Sara Hurwitz, each wrote a question on the topic of their choice and answered it as well—opening up a dialogue between visitors and some of today’s most groundbreaking Jewish leaders. I have to say that I was a little nervous that our “guest curators” would form questions out of statements they already agreed with—it can be tough to compose yes-or-no questions that elicit meaningful answers, and it’s easy to fall into the trap of writing a question you already believe to be a true statement. But in the end, only one answered “yes” to her own question, and all of them are receiving tremendous attention and thoughtful feedback in the gallery. It is rewarding to see our visitors so engaged with these topics, and I would welcome these women back as guest curators any time! The Museum’s collection numbers over 25,00 artifacts, ranging from 18th century one-of-a-kind documents to Yi ddish theater costumes to turn of the 20th century typewriters. Our collection includes artifacts of national significance, as well as those that tell the personal stories of everyday American Jews just being American Jews. Today we had the honor of enriching our collection with a one-of-a-kind artifact that artfully, playfully, and poignantly represents the latter. As each man spoke at the presentation of the “Kup” to the Museum, it was evident to all those in the room—spouses, family members, staff, and one member of the team participating via Skype—just how much the friendship that developed on the golf course rekindled and encouraged the team members’ and their wives’ Jewish identities, brought to life around the many Shabbat dinners they shared with “De Yiddishe Kup” at the center of the table. We at the museum promise to lovingly and respectfully refer to our new artifact by its formal name, “De Yiddishe Kup,” and we are so grateful to be its new home. How Many Registrars Does It Take To Screw In A Light Bulb? Just one: Chief Registrar and Associate Curator Claire Pingel. Oh, and five strong art handlers. 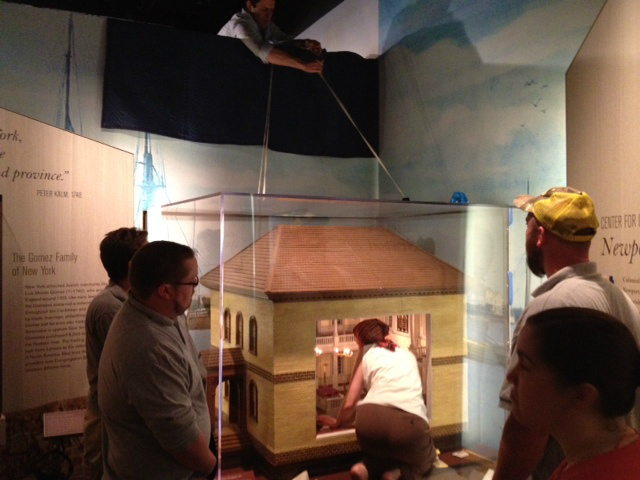 It took only 40 minutes to crawl into the vitrine and replace the bulbs that light up the Museum’s model of the Touro Synagogue created by St uart Gootnick, an artist who designs miniatures. 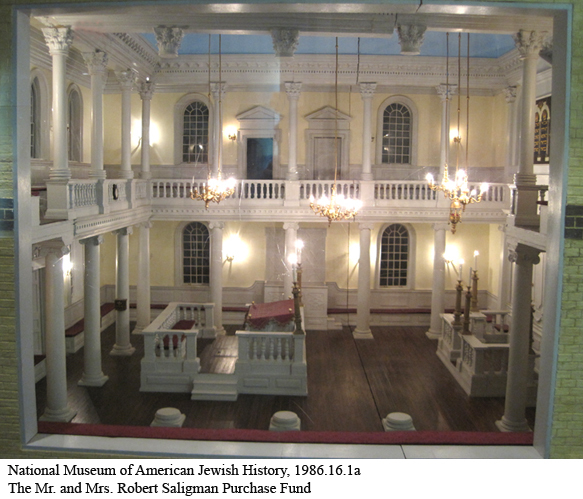 The real Touro Synagogue is the oldest surviving synagogue building in the United States. It was also the Synagogue which received one of the most important documents in American Jewish history: a letter which Washington wrote to the Newport Jewish community, composed in response to their letter to him. In this letter, President Washington affirmed rights and privileges generally unknown to Jews for millennia. Even more importantly, it underscored the new nation’s commitment to religious liberty and equality for people of all faiths and confirmed the new President’s commitment to a government that “gives to bigotry no sanction, to persecution no assistance.” The letter will be featured in the Museum’s upcoming exhibit, To Bigotry No Sanction: George Washington and Religious Freedom. In case you are wondering, yes it got quite warm in there. Yes they used commercial dollhouse bulbs with a tungsten filament, and yes, the guy at the top had to hold onto the rope the whole time. As for the Schmatte Claire Pingel has on her head in the picture, this was so the chandeliers wouldn’t catch in her hair like they did last year. To Bigotry No Sanction: George Washington and Religious Freedom will run from June 29 through September 30. For more information, visit nmajh.org/specialexhibitions/. This evening, award-winning journalist John Hockenberry is moderating what is sure to be a lively conversation at the National Constitution Center with a panel of experts about the health care reform debate . As the nation awaits the Supreme Court’s soon-to-be-announced decision on the constitutionality of the Affordable Care Act, the National Constitution Center’s Peter Jennings Project and The Constitutional Sources Project (ConSource) are presenting a timely program to illuminate the impact of this pivotal ruling. What does this have to do with American Jewish history you ask? Not much. Other than the fact that John Hockenberry was kicked out of the National Constitution Center for a few hours today so that the Secret Service could sweep the place for First Lady Michelle Obama. Mrs. Obama led a private rally there today held by the campaign to re-elect President Barack Obama and Vice President Joe Biden. Here's where we come in. Our Museum tells the story of immigrants. People moving from one place to another to find refuge and freedom in this great country. 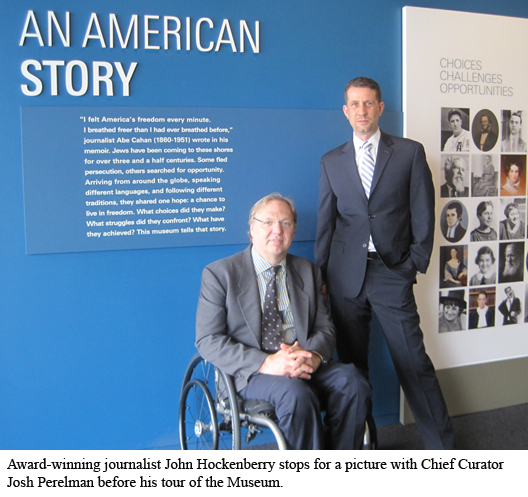 So too did Mr. Hockenberry find refuge when he decided to spend his free hours here, across Independence Mall, at NMAJH. He spent his time touring the Museum with Chief Curator Josh Perelman and getting some work done in our offices in preparation for this evening. We were excited and honored to welcome him in.